This thread will contain my guide for FOnline mapper. I will gradually translate and update my old guide which can be found here. 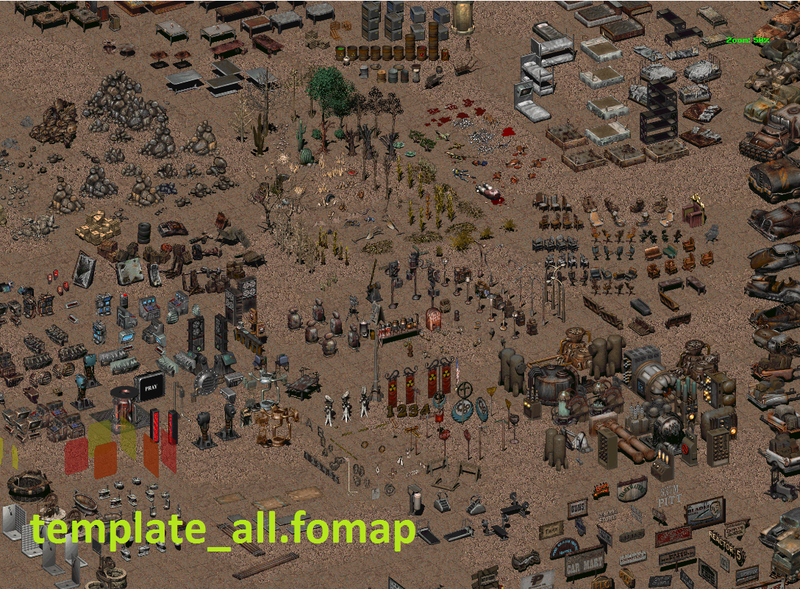 The mapper package is quite different this time, because it contains more than 1000 various maps - Fallout 1 & 2 maps converted to FOnline format, 2238 source maps, TLA maps and also some maps from unfinished Wasteland 2155 project. In addition, it contains several template maps which are very handy in fast mapping, and of course the everlasting great "e_desert1" map. Note: this version of mapper is compatible with our post-wipe Reloaded. Mapper download link (270 MB) - contains current Reloaded mapper and various map packs. 3. 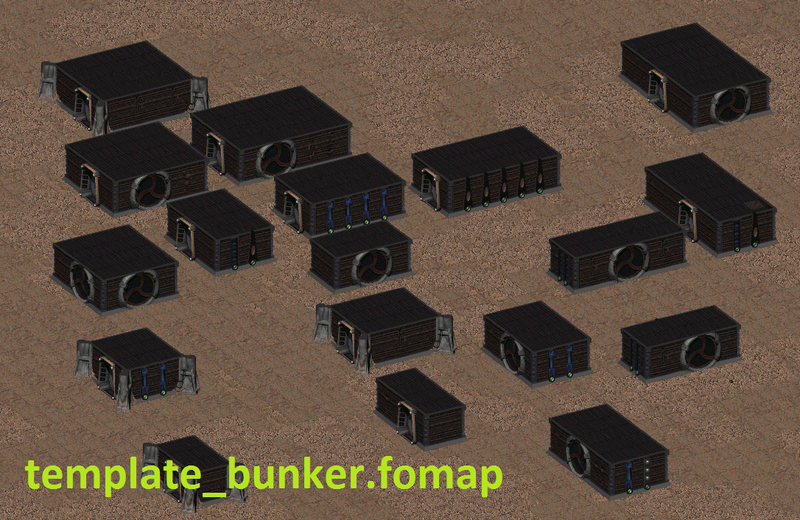 Copy "fallout.dat" from your FOnline client to mapper's /data directory. You can find "fallout.dat" in full client. If you don't have it, see readme below - master.dat/critter.dat will do. Some parts might be less relevant to FOnline: Reloaded, especially two last guides. Copy fallout.dat from your Reloaded client to mapper's data directory. If you don't have fallout.dat, you can copy master.dat and critter.dat files there, but you need to edit /data/DataFiles.cfg (remove fallout.dat entry and add master.dat and critter.dat entries). Maps included in FOnline: 2238 source release. Almost fully compatible with FOnline: Reloaded. 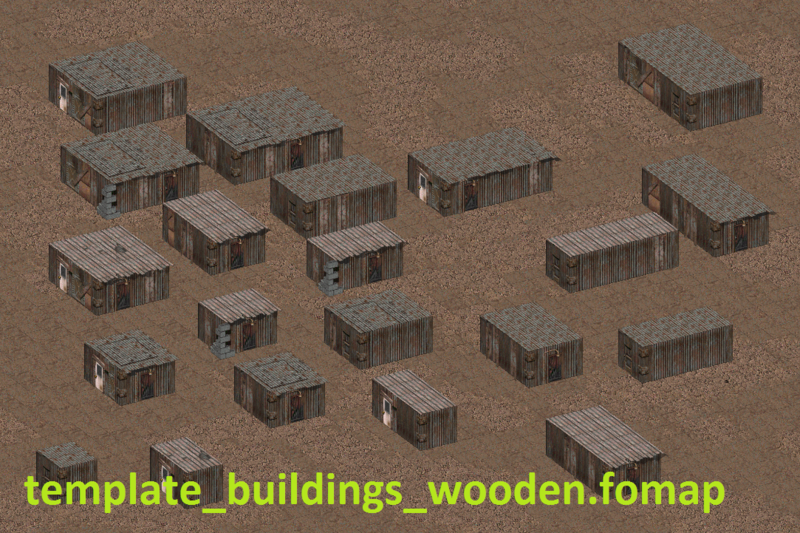 The package contains all of Fallout 1 and Fallout 2 maps in FOnline format (saved in mapper v1.33.1, FOnline SDK revision 412). No further changes were made to the maps. To be able to use them with FOnline SDK, they have to be reworked first. Critters are not compatible with FOnline Reloaded critter prototypes. If you don't see the map after loading, first zoom out as far as you can, then try to scroll a bit left-down. 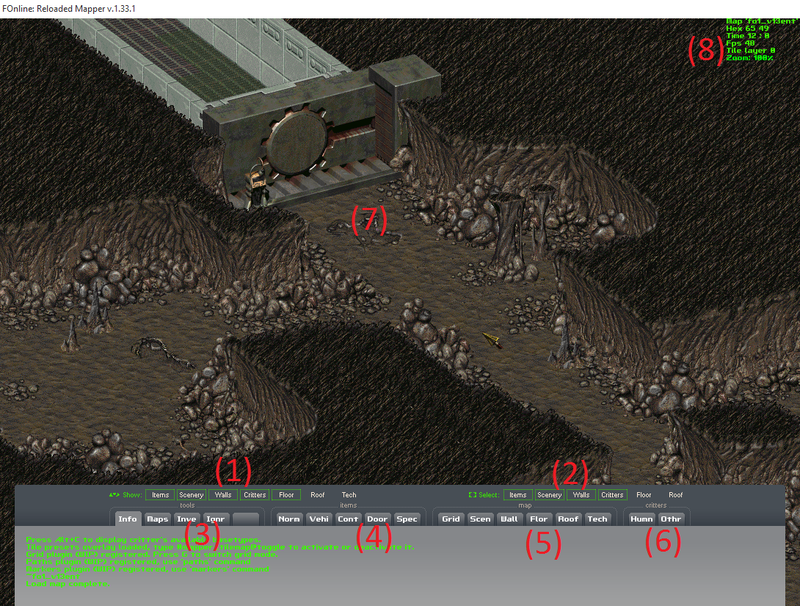 Fallout 1 master.dat contains also encounters map with a caravan object inside. They can't be considered as additional content so they were not included in the package. The mapper does not support Fallout and Fallout 2 map formats, as well as older FOnline map formats. Useful for quick copy-paste, they allow to find needed objects very fast. These maps were included in the package, but please note that they are not compatible with Reloaded server (scripts, scenery, critters). Some maps will show wrong scenery. They should be used only as copy-paste source. Maps from the unfinished Wasteland 2155 project. First public release. Not compatible with Reloaded server, should be considered only as copy-paste source. The package also contains arena map from FOnline: Battleground project. To open/close console, hit Enter. ^<map name> [/text] [/nopack] - save the current map to the file. "/text" to save it in text format, "/nopack" to save it in unpacked version. To run a script function, use "#". Executed function must be of prototype "string FuncName(string)", string argument is passed from a console, and function results will be displayed in the message box. Default module is "main", to execute a function from another module use "@" (for example, "#module@MyFunc"). Result in the message box: "Result: Hello world!". Scripts are placed in the "/data" directory. List of loaded scripts is in /data/scripts/scripts.cfg. The main script is mapper_main.fos, which contains all reserved functions, and basic list of API functions. To change the resolution, edit /data/FOnline.cfg file with Notepad (ScreenWidth and ScreenHeight values). Mapper interface can be modified via /data/mapper_default.ini file. (8 ) Other useful info, like current map name, current (x,y) coordinates, in-mapper time (static), tile layer and zoom value. Tabs contents can be modified via /tabs.cfg file. If you added a new item (in prototypes, /data/proto/...), you have to add it's PID to some tab in tabs.cfg file before it becomes available in mapper. Upon selecting an object, an option window will appear allowing to edit some of it's properties (marked green; white are not editable). To add an object to Ignored objects list, click it with Ctrl on the object selection panel. To add an object to the container or inventory, click it with Alt on the object selection panel. To put an object in a critter's slot, click the item in it's inventory with Shift. To apply a change in the object properties window to a range of selected objects (of the same type), click To All button. To remove selected object(s), press Del. To change direction of a critter, use middle mouse button. To switch between placing floor and roof tiles, use middle mouse button. To add a range of objects to already selected objects, hold Ctrl. To change zoom, use mouse wheel. To play animation of a selected critter, use "@" command with codes of desired animations. For instance, to play animations of movement, and then using, type "@abal" (case is ignored, as well as whitespaces). If no critter is selected, all critters on the map will play the animation. To move a critter, select critter and hold down Shift and click the desired position. Also, when you move selected tile/object, you can hold down Shift to move it more precisely, position offsets will be applied automatically. F7: Hide/Show the main panel. Shift + F7: Fix the position of the main panel (enabled by default, drag & drop). F8: Enable/Disable scrolling with mouse. F9: Hide/Show the object properties window. Shift + F9: Fix the position of the object properties window (disabled by default). Shift + Escape: Exit the mapper. Del: Delete the selected objects. Ctrl + X: Cut objects. Ctrl + C: Copy objects. Ctrl + V: Paste objects. 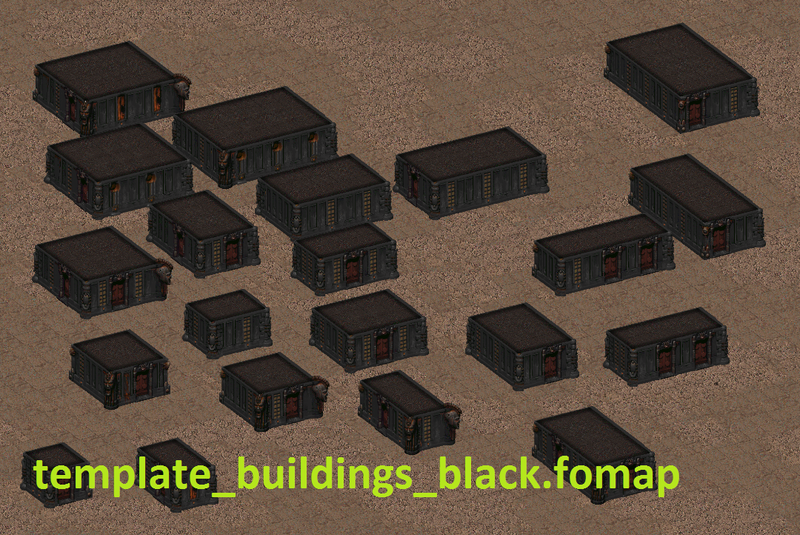 Ctrl + A: Select all (only objects that are visible in map view). Ctrl + S: Enable/Disable ignoring of scroll blockers. Ctrl + B: Show impassable hexes. Red are impassable, and not shootable through. Green are impassable, shootable through. Ctrl + M: Display NPC information over their heads (this has few modes of display). Ctrl + L: Save the log to a txt file. Tab: Change the type of objects selection (diamond or rectangle). +: Change time by 1 hour. -: Change time by -1 hour. Note: if you copy object/objects in one map, you can switch and paste it in another map - it will appear in the same position as in original map - so check coordinates, and zoom out before pasting if necessary. Important: there is no UNDO option in Mapper. If you add, or delete something - the only way to undo is to load your last save. That's why you should save your progress frequently. Be careful about saving maps - there is no confirmation message. Always be sure that you know what you are doing - there is no problem if you load instead of saving (map will be opened and you can switch back to the previous one via "maps" tab), but if you save instead of loading - the map you wanted to load will be overwritten. Always have backups of your maps. 241 - starting position for players on a map with NoLogOff flag. 243 - car entry point. 245 - vertibird entry point. 246 - boat entry point. FOnline maps are saved in .FOMAP format. It is a text format - you can open and edit it with Notepad. In theory, you can create whole maps from scratch using a regular notepad, without running a mapper :> In practice, only a real madman would do that. Nevertheless, making some edits in Notepad might be necessary. NoLogOut - if it equals 1, characters do not disappear after logging off (they are in (off) mode), and if it equals 0, characters disappear normally after the time defined in scripts / config.fos. In this section, each single line defines the individual tiles on the map. Some objects have additional lines with properties. Let's talk now about practice. People who make the map for the first time in the vast majority of cases make simple mistakes. I will try to describe some of them in this post. Many objects, such as boxes, computers, car wrecks, contain only one hex blocker. If you don't put additional blockers, characters will be able to walk on the object and it will look bad. Blockers can be easily viewed by pressing CTRL+B. Also, most buildings have missing blockers as well, and it results in holes in some walls. These should be manuall filled with proper blockers. There are also not-transparent windows in some buildings sometimes. This should be fixed with a window blocker that blocks only movement. Exit - most of the time via exit grid. Green grids are used to enter another map of the same location. Red grids are used to exit the location (and proceed to world map). The exit grid itself is not enough - EG special hexes should be put on exit grids. Sometimes an object is used to move between the maps - like a ladder, stairs, manhole, elevator. 246 - used for boats (well, yes). Every map needs scrollblockers around it. Scrollblockers should be rectangular to avoid possible problems with scrolling. Always remember about higher resolutions. Well, it's not 2009 anymore and if I make a new map, I make sure it will cause no problems in 1920x1080 resolution. Excessive use of elements of the same type. Example: a forest made of objects of the same type, scattered carelessly on the map. The same goes for cacti in the desert, barrels, grass - it doesn't look very good. Same about tiles. 5. Mixing objects from different "palettes". Many people who make their first maps put too many objects in them - avoid this. All map elements must form a whole - for example, a Brotherhood of Steel computer does not look very well in the middle of a wooden house. Most mapper objects are grouped by palette. It is unacceptable to mix elements from more than 2-3 pallets. This applies to buildings - the map should contain no more than 2 building styles, except special cases (such when the map is very large). 6. "Empty" parts of the map. Different amount of details in various parts of the same map looks bad most of the time. 7. No general concept of map. Before you start making a map, think about what you want to make. It does not matter whether the plan will be drawn in a jpg image or on a paper with a pencil - it is important that you know from the beginning what you want to do and what its main parts are. I've seen some examples of such tile usage and I don't think they are very impressive. 9. Maps are not "falloutish". If you don't know what "falloutish" means, open some Fallout 1 maps and pay attention to details. Many maps from Fallout 2 are also good - like Den, Modoc, Redding, Sierra Army Depot, Mariposa. Remember that it's a dirty world after apocalypse, don't make clean maps unless it's a working Vault. Long ago, a guy called Krizalis made several useful maps with building templates and object palettes and later shared them with us. I've converted them to the latest version of mapper and included in the mapper package. What's the deal with templates and palettes? As you know, scrolling through the list for one particular tile, wall element, roof, or one-of-a-kind table, chair, etc. can be time consuming and annoying. Therefore, it is faster and better to use templates and palettes. 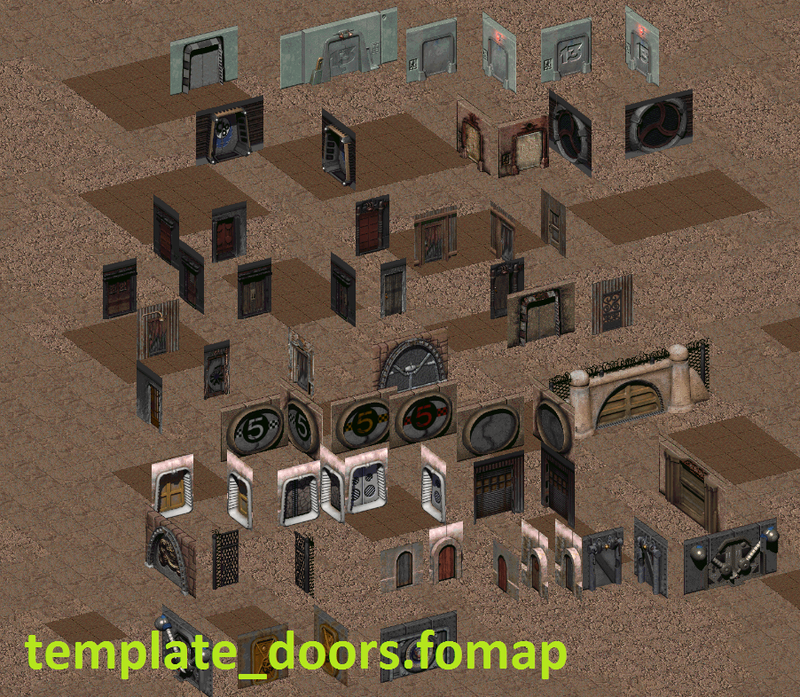 Open your map, and then open palette maps with objects that might be useful for you. 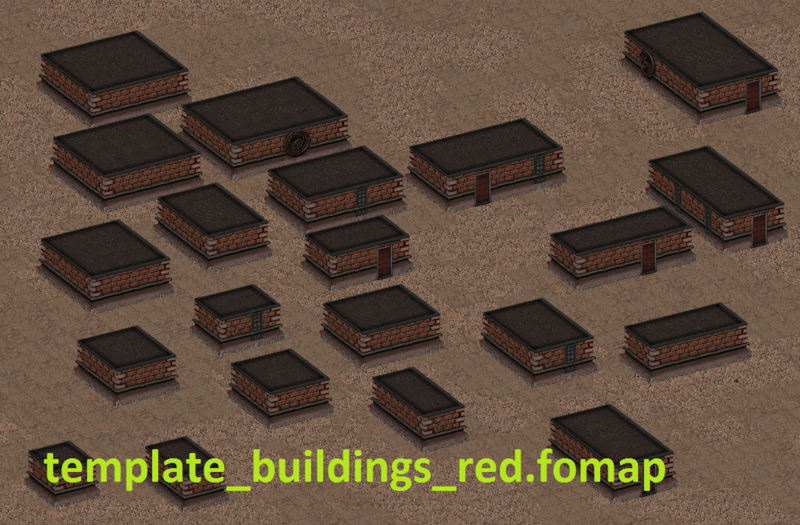 When you need to copy-paste some object just switch to a proper palette and copy the object there, then switch back to your map and paste it! Of course more complex objects like buildings will have to be edited, but you will have almost all parts of it in place. 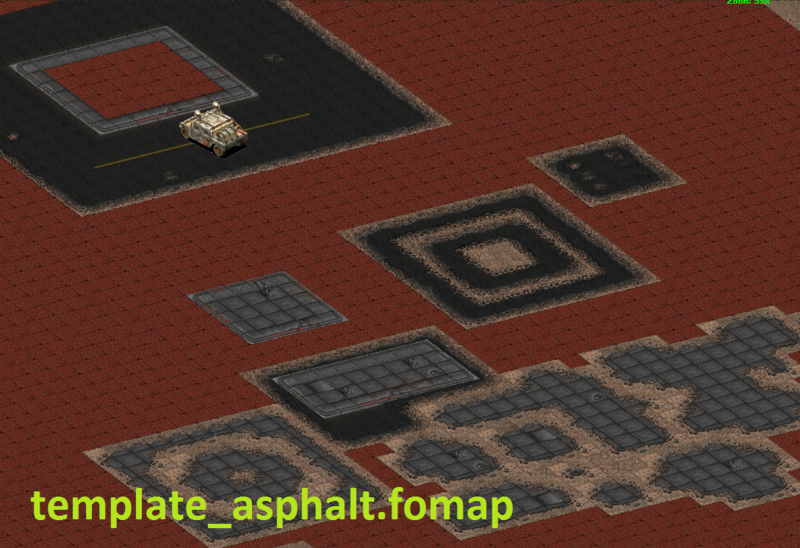 template_asphalt.fomap - palette of tiles - asphalt elements, sidewalks, etc. Guide updated, mostly with what was in my old guide but a bit improved. Few parts are still missing but I'll add them later.